NOTICE: This Level IV ceramic plate has been discontinued Please see the NEW VERSION of our Level IV plates HERE! NOTICE: This Level IV ceramic plate has been discontinued - Please see the NEW VERSION of our Level IV plates HERE! Are 30.06 APM2 (armor piercing) rounds a concern? AR500 Armor® level IV Body Armor is rated for up to and including just that threat! 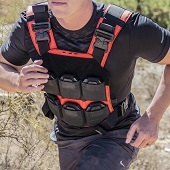 We are known for offering the most rugged and affordable body armor in the industry; and we've raised the bar again in terms of quality and value with our Level IV body armor solution. With a profile of .75" thick, our level IV body armor features a thinner profile compared to what's currently being offered on the market at 7.5lb's per plate. Rated for a single 30.06 APM2 (7.62mm x 63mm 165gr Armor Piercing, Black Tip) round, and all lesser Level III threats, AR500 Armor® Level IV Body Armor provides protection against a higher threat level than our traditional Level III body armor. 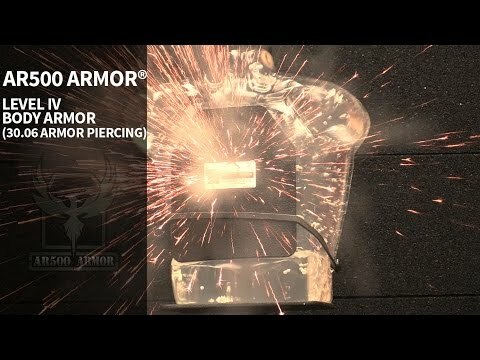 Stand-Alone, our Level IV body armor does not require any additional backing or soft inserts to meet the threat level. The curved contour improves comfort and ergonomics, with a similar design to the contour of our Level III body armor. We utilize a durable single panel ceramic strike face to maintain the best ballistic properties for higher level threats, and a composite backing comparable to a traditional armor system that is similar to what is currently, standard issue in the military. Coated with our PAXCON protective coating in conjunction with our strike face, and spall & fragmentation containment technology, our Level IV body armor is industry leading. Fully sealed from the elements, our PAXCON coating creates a water tight seal which protects the inner armor components from liquids, chemicals, UV, sweat, and other harsh elements and is designed to be used as a front or back plate. Since we did venture away from steel on this offering, we wanted to chime in on the "Why". The reason for this was weight, cost, & performance. When attempting to defeat 30.06 M2AP rounds, the required thickness of steel adds enough weight and cost to the point of ceramic becoming a viable and very effective solution (with current technology). Simply put, a steel level IV solution in 10" x 12" would weigh nearly 13lb's per plate. We feel we have one of the more rugged and durable level IV options available, for ceramic/composite construction. Designed to defeat a single round of 30.06 Black Tip M2AP, and any lesser rifle round per NIJ standards. We aim to over deliver on our armor, and with reasonable shot placement, have stopped multiple rounds of M2AP. Simply put, if 30.06 M2AP is not a concern, our Level III solution provides above average protection within the realm of level III threats. Level IV single-shot protection against .30 caliber armor piercing (AP) bullets (U.S. Military designation M2 AP) with a specified mass of 10.8g (166gr) and a velocity of 2880 ft/s (+/- 30 ft/s). Review from E.W. Review by E.W. Review from Christopher J. Review by Christopher J. Review from J.B. Review by J.B.
Review from M.B. Review by M.B. Thomas and the gang are excellent to deal with. Great products and service, highly recommended. I received my plates within the week after I ordered them. Opened the box and was instantly happy. Great design, fits well to the body, and I absolutely love the paxon coating on the plates. Gives an extra level of protection from being damaged if dropped or banged around. I work in Law Enforcement and bought these plates for those crazy calls or active shooter scenarios. Couldnt be happier. Thanks AR500! You're reviewing: AR500 Armor® Level IV Composite Body Armor - 10"x12"